Bet Red Kings is a newer addition to the online bookmaking market. 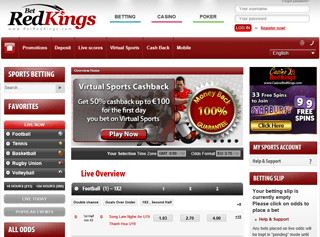 Founded in 2009, the website is part of the Red Kings gambling giant. The company is licensed in Malta and Gibraltar and offers a variety of games to customers worldwide. On Bet Red Kings, you can bet on sports, play casino games and enjoy your favorite Poker game in some tables. As you might probably know, the Red Kings group owns RedKings.com – their well-established poker site. The group used the fame they have gained to promote the new sports betting subsidiary. Of course, the website has a mobile version, crafted to give you the best experience when used with a phone or tablet. Another selling point is that the internet site of Bet Red Kings is available in the whopping twelve languages! The web design site is clean, with white and various shades of gray taking up the page. Dark-red is used for the more distinctive accents, and I have to say, the chosen colors contrast very well with each other. As per most bookies, Bet Red Kings uses the three-column layout. Favorites and sports on the left side, upcoming matches in the middle and banners and your betting slip on the right side. More importantly, you will not get lost in buttons and sub-menus. Everything you need is right there on the dashboard. If I had to give a grade to user experience and ease of use – I would give this website an A. Bet Red Kings offer a vast amount of betting options. Players can bet on 21 different sports. As an extra, special events are made available and the bookie accepts bets for various world affairs. Customers can enjoy their favorite Football, Tennis, and Basketball, but niche sports like Floorball, Snooker and the Australian Futsal are also freely available. Some of the games get live coverage on the website and the odds shift in real time, giving players a dynamic environment to test their mettle and multiply their deposits. The casino section is rich on options, too. All the regular NetEnt games are there, including slots, card games, roulette games, video poker, live casino and others. Currently, the big hit is the Guns N Roses video slot machine, as you can see on many bookmakers who use Net Entertainment as their casino provider. Aside from traditional games like James Dean, Vegas Hits, Monopoly and Dazzle Me, players can enjoy fast-shifting, progressive jackpots. The large sums of money are open game for everybody who uses the service. The Live Casino offers three types of games – Baccarat, Roulette, and Blackjack. 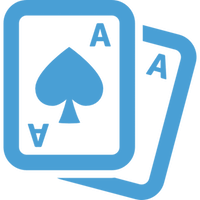 The Poker part of Red Kings is what the company is best known for. Sporting a lot of players already, you can easily jump into the action. As cool as Red Kings are, they offer both a downloadable client and an instant play version on their website. This is good news since now you can play poker anytime, anywhere. Tournaments rotate over and over, and you can join a variety of poker races at will. The odds on Bet Red Kings are average. Yes, you won’t get better offers than some exclusive bookies, but you will also not get lower odds just because. 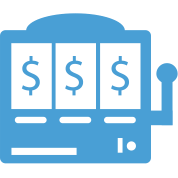 Most games provide significant amounts of markets, so you should have absolutely no problem varying your bets at will. You can get some good payouts from Goals over Under, Handicaps, Goal scorer, correct score and Winning margin. All of these options have a higher average payout than the rest but are harder to get right. Bet Red Kings want the best for the players, so the company uses a 256-bit encryption from RapidSSL. The provider is well-known and preferred by many website owners on the Internet. Your money and personal information will be safe with Bet Red Kings. You can contact the support department by e-mail and phone. I did not see a live chat option, although that would be very useful. You can view the website in eight official languages, with English being the main. Bet Red Kings support a tremendous amount of banking options. This is probably the biggest collection I have ever seen on a betting website. All the main credit card providers, various e-wallets, and many less known options are available for your leisure. The only negative with Bet Red Kings’ banking is that your funds always get forcefully converted to dollars before processed. This little quirk might be inconvenient for some of you out there. With Bet Red Kings, you can get a plethora of bonus offers and promotions. For first deposits to the sports book, you can grab a 100% welcome bonus, up to 35 EUR. A 100% bonus up to 1000 dollars/euro awaits you in the casino! And to top that off, you also get 100 free spins. Your second deposit also gets doubled, up to 500 Euro/dollars. The largest offer, however, is the Poker signup bonus. You can get up to 2500 EUR on your first deposit. Go, check Bet Red Kings out!